A delicious Gluten-Free Chicken Pot Pie made from scratch using chicken, carrots, onion, peas and a creamy, smooth gravy like sauce. 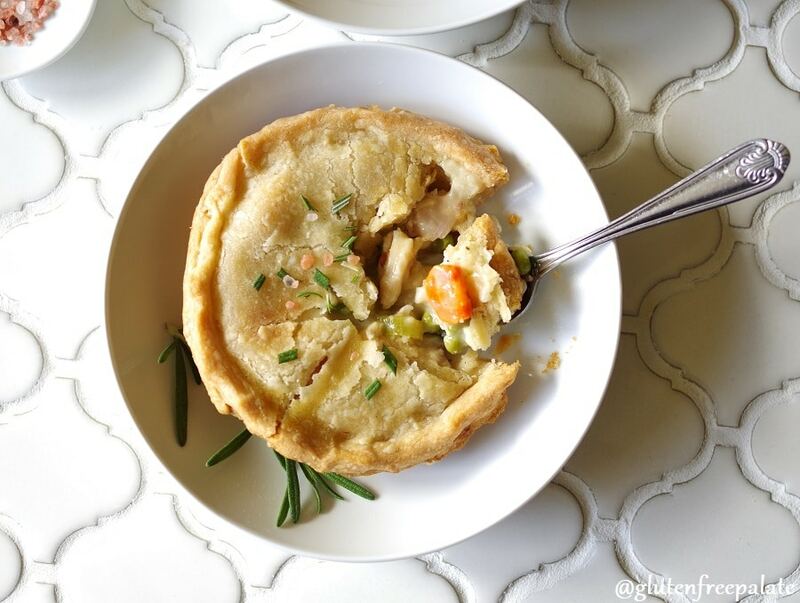 Gluten-Free Chicken Pot Pie is one of those meals that comforts you on a rainy day. It’s perfect when you are looking for a warm, savory dish during the winter months, and it really hits home when you are having a rough day. Gluten-Free Pot Pie is my husbands number one favorite meal. Every time we get a rotisserie chicken, he asks me to get another one and make him a couple batches of pot pies. He usually eats one or two, then we freeze the rest. 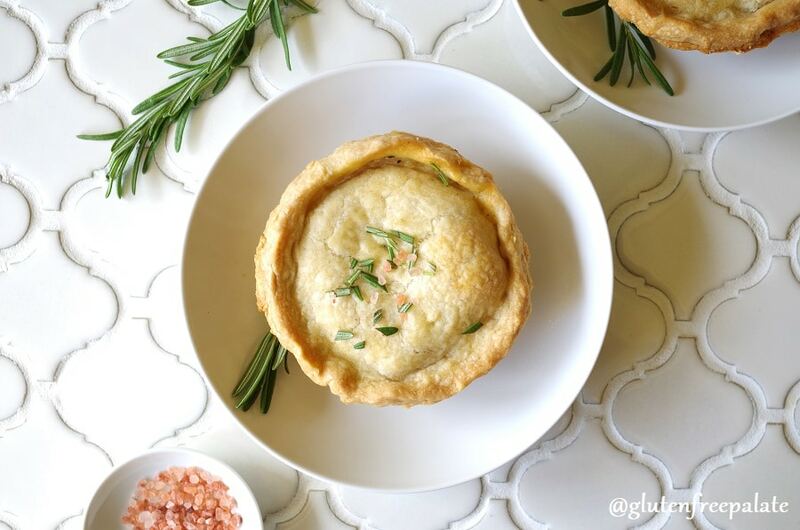 A lot of people stay away from gluten-free pot pies because of how time consuming it is. 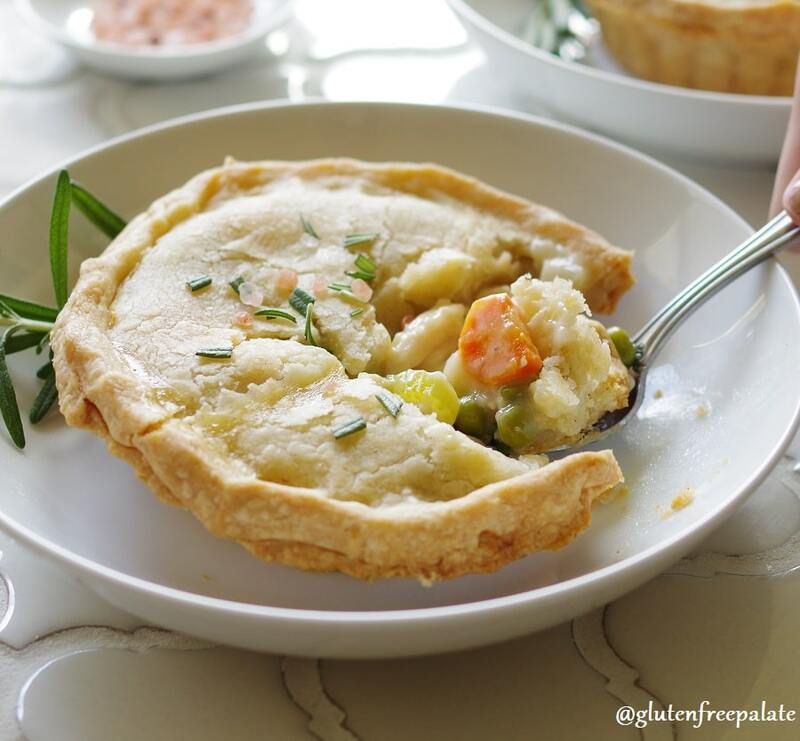 This recipe for Gluten-Free Chicken Pot Pie is broken down into it’s simplest form. If you need an even simpler recipe, you might want to consider buying a crust mix, or a ready-made gluten-free pie crust. Gluten-Free Chicken Pot Pie is perfect for lunches, or heating up after a long day. It’s one of those meals that’s good all year round, and will warm you from the inside out. A couple years ago we visited my sister for Thanksgiving and she had purchased a smoked Turkey. Have you ever had smoked Turkey? It’s not for everyone, but we think it’s pretty amazing. 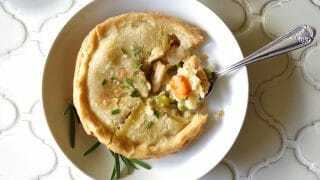 I have a recipe for Gluten-Free Turkey Pot Pie that is based off this gluten-free chicken pot pie recipe, if you are interested. 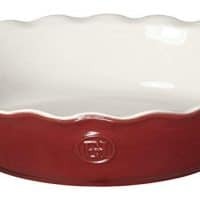 The next year we asked her to pick us up one so we could make pot pies with it. Smoked turkey adds a subtle and smokey flavor to the pot pie gravy that is second to none. If we run out of smoked turkey, we either cook up chicken, or buy a rotisserie chicken and chop it up. If you like a buttery flaky gluten-free pie crust filled with a savory gravy, fresh vegetables, and chicken – you will love these Gluten-Free Chicken Pot Pies. If you are in a pinch, My Gluten-Free Miami has a quick and simple recipe for Gluten Free Chicken Pot Pie Muffins that’s incredible. 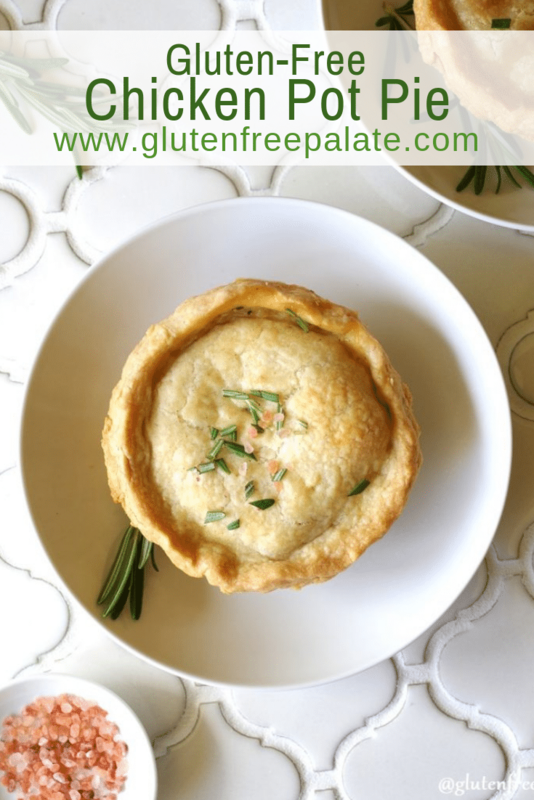 I am working on creating a one-crust version of this gluten-free chicken pot pie and I’ll update this post and link to it when it’s up on the blog. 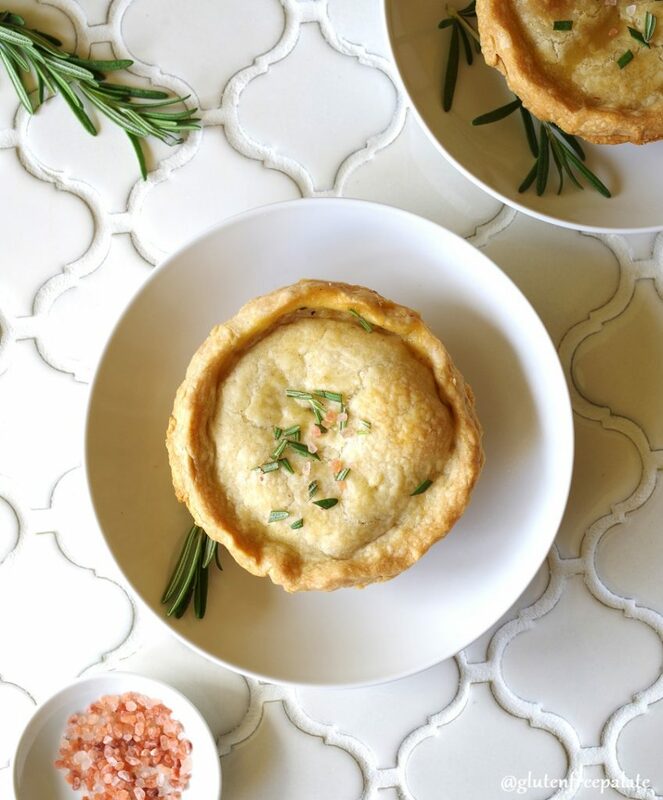 These little pot pies were made with a mini-pie pan. When I’m not feeling up to cutting out mini-pie crusts, I make one large gluten-free pot pie, using a 10″ pie pan. You can make either, just make sure to adjust your cooking time. If you are more of a chicken and biscuits kind of person I have a recipe for Gluten-Free Chicken and Biscuits that you are sure to love. It uses the same filling recipe as this gluten-free chicken pot pie. Can I freeze gluten-free chicken pot pie? Yes. I usually bake it first then freeze it, but because all the ingredients are already cooked you can freeze it before you bake it. Just note that the crust may be a little softer if you bake it before you cook it. These Gluten-Free Chicken Pot Pies are our go-to when we need something comforting. It’s such a comforting and warm dish, and everyone in my family enjoys them. I hope you will give them a try. If you do, please come back and leave a comment telling me what you thought. Believe it or not, I get this question often. For the most part, yes, chicken is gluten-free. Sometimes during processing fillers are added to the chicken to add flavor. Sometimes those filler are not gluten free. Always check labels if you are buying chicken at the store. Have a question? Please ask away in the comments and I will try to get back to you in a timely manner. 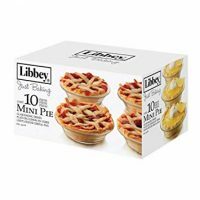 The exact pan that I used to make these mini pies isn’t available anymore but Cobble Creek makes a silicone mini-pie pan set. Can I make one large gluten-free chicken pot pie, instead of small ones? Yes. Divide dough in half and roll each ball of dough out on a gluten-free floured surface with a rolling pin until approximately 10-inches in diameter. Alternatively, roll dough between two pieces of wax paper. Bake for 30-35 minutes or until the crust is brown and flaky on top. Not all chicken broths are gluten-free. While chicken is gluten-free in it’s natural form, sometimes glutinous ingredients are added to chicken broth for color and flavor. Always check labels on gluten-free chicken broth before purchasing. Looking for more amazing dinner ideas? You might also like my Instant Pot Beef Short Ribs or my Spicy Sausage and Black Bean Soup. If you need something that you can fix and forget, one of my go-to recipes is Crock Pot Teriyaki Chicken. If you make this chicken pot pie, please stop back by and let me know what you thought! For the crust- Preheat oven to 425°F (220°C). In a medium mixing bowl, combine flour,salt, and xanthan gum. Place one circle of dough into the pie pan and trim edges if necessary. For the filling- In a medium saucepan, combine chicken, carrots and peas. Add water to cover and boil for 15 minutes. Remove from the pan and drain; set aside. If you are using precooked chicken, cook the peas and carrots, then add in the cooked chicken after draining. In the same saucepan over medium heat, cook onions in butter until soft and translucent. Stir in flour, salt and pepper. Slowly stir in chicken broth and milk. Place the chicken and veggie mixture in bottom pie crust, filing about half way. Pour the gravy mixture over the top and fill about 3/4 of the way. Cover with top crust, seal edges, and cut away excess dough. Cut small slits in the top to allow steam to escape. Bake for 30 to 35 minutes, or until pastry is golden brown and filling is bubbly. Hi! I just saw this recipe and I’m craving for chicken pot pie! My only issue is, I can not have dairy. Would this recipe still work if I substitute the milk to almond (or any other plant base) and vegan butter?? Thanks for your response! I just use water for GF/DF Crust and vegan butter. Try the Silk brand nut milk in the red cap. No added vanilla flavor and we cook with this one most often. Works great. We are dairy free too. The first time I made this I used a real onion. The second time I used the chopped onion that she recommended and it was ungodly horrible. I cooked this thing for hours and when it was finally done I could not take more than two bites. If you decide to make this, use REAL ONION. I’m not sure what you mean about using real onion versus chopped onion. I used a real onion in this recipe and the instructions just ask that it be chopped up. What did you use? My guess is Lexi misunderstood the recipe and used dehydrated chopped onion (the spice) which would have a significantly different flavor. That’s my guess as well. 🙂 Thank you for the reply. I use about 1/4-1/2 c. coconut cream for the milk and it works very nicely. I use flax meal whenever the recipe calls for xanthan gum. I’ve never had a recipe fail from that replacement. Mine is cooking now. Yum!! It was a hit all around! The crust was amazing, so flaky and thick. I used half almond flour/half namaste perfect blend mix. I also hid a package of riced cauliflower in the veggies (in a double recipe) and no one was the wiser with it having the delicious gravy, which I made with coconut milk since I needed it dairy free. Thanks for the fantastic recipe! I’ll use this crust for other meals as well. Thank you for stopping back by and letting me know. I’m so glad you enjoyed it. Made this for dinner tonight. It has been a year since we have had Chicken Pie due to my daughter having Celiac Disease. WHAT A HUGE HIT!! Thank you for sharing! It will definitely be a regular!! Thank you so much for stopping by and letting me know! So glad it was a hit. I loved this recipe! I used the frozen gluten free crusts I buy at Sprouts, so the quantity of filling and sauce was far too much (but I’ve made notes for myself on that.) In addition, I substituted 1/2 cup white wine for that much of the chicken broth, which gave it an extra flavor. Having to avoid dairy, I used Earth Balance “butter” and plain almond milk, and they worked just fine. Thanks for giving me something new to my old and tired repertoire of dinners. I usually bake them up, then freeze them. We then pull them out of the freezer to defrost, and reheat. I am so glad you like it. Thank you for letting me know. When we reheat, we usually let the pot pies defrost and heat them for 10 minutes at the same temperature in the oven or we reheat by serving in the microwave. When my husband wants mini pies, he reheats them in the microwave for 3-4 minutes, then let’s them sit for 5 minutes so the heat can transfer through. I substituted White potato for sweet potato. It was soo good!!! I also used a jumbo muffin tin. My hubby can’t have peas so I used chopped up broccoli, carrots. I think she added chopped sweet potatoes to the pot pie. My recipe doesn’t call for potatoes but occasionally I’ll through some in there. Any idea on the baking time if I just made it into one large pie rather than many smaller ones? This looks great for baking before baby comes this fall! Because the ingredients on the inside of the pot pie are cooked, you’ll want to focus on the large pie crust. I’d start with 35 minutes, and watch it from there. Hi Chrystal! I’ve made these before and LOVE them! I usually make one big one instead of a bunch of mini ones, and I’m planning on making about four this evening to have for the next couple of days. Is there a preference on when I should eat them up by before they go bad? How are you freezing them? 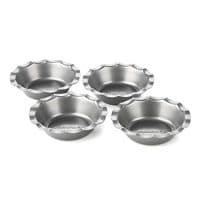 Are you using mini tin pie pans? Are you wrapping them? I’ve never frozen a pot pie before and am curious how you do it! Thanks! If I make the mini pot pies I freeze them in little glass containers, individually. That way my husband can either take them to work for lunch straight from the freezer, or re-heat them when he wants. When I make large ones, I wrap them and then place them in a zip lock bag (if they fit, when I use a 8″ or 9″ pie pan). I always cook them first and let them cool to room temperature before I freeze them. Hope that helps! Hi Chrystal. I’m new to GF baking and still a little confused regarding the different types of flours. When the recipe says GF all purpose flour blend #1, does this mean 1 to 1? Thank you in advance for your response. Looking forward to making this!! My homemade gluten-free flour blend is supposed to be linked (I’ll have to fix it). For this recipe, you can use Bob’s Red Mill 1-to-1 gf flour or King Arther gluten-free flour. Also, if you don’t want to make your own crust you can use a store bought crust or Schar’s gluten-free puff pastry dough. If you are just getting started (but are an avid baker), and you’ve made pie crusts in the past, I recommend making your own pie crust. My husband made this using Pamela’s gF baking mix and frozen mixed veggies. It came out soooo good Thanks Chrystal! Thank you for stopping by and letting me know! So glad you like the recipe. Awesome recipe! The crust is superb! Looking forward to using the crust for other recipes too! I used Earth Balance for the butter and Vance’s Dari-free for the milk. Thank you for sharing your recipe! I have never made any gluten-free recipes. I am making a dinner for a new Mom who cannot have gluten and is also soy-intolerant. Can you tell me what I need to watch for as far as any ingredients having soy? Also, the pot pies I have made in the past I make in a 9 x 13 dish with only the top crust. Should I double the ingredients for a 9 x 13 and would your recipe need a bottom and top crust or would it work with only a top crust? Thank you for your recipe and for posting the helpful comments/questions & answers. Some dairy-free butters are made with soy. But in this recipe you shouldn’t be using any ingredients that have soy in them. The crust recipe that is part of this recipe make enough dough for two pie crusts, the top and bottom of a pie pan. If you are making a 9X13, you should have enough pie crust to cover the top. Have you looked at my chicken and biscuits recipe? It has the same filling with biscuits on top. It might work better for you. Hands down best pot pies (and crusts!) I’ve ever tasted. We’ve made them twice with perfect turnouts each time, and we’re having them again this week. Thanks for sharing this amazing recipe. I am so glad you think so! We love it too. Thank you for stopping by and leaving a comment. Thanks Chrystal, this looks great! Do you not pre-bake the pie crust? I thought it would get soggy if you don’t. No, you don’t have to pre-bake the crust as long as you bake it within 30 minutes. I hope that helps. I made this. It was delicious. Definitely adding it to the dinner rotation. Thank you! I’m so glad you liked it! Thanks for stopping by and letting me know. Thank you Chrystal for this fantastic recipe. The filling was AMAZING! For the chicken broth, I used a heaping teaspoon of better than boullion mixed into 1 3/4 C. water. We have people in our house who are sensitive to cow’s milk, so I substituted goat’s milk and it was delicious. We have allergies to green peas, so I substituted broccoli. Also, I am not a pie crust maker, because of my many failures, the thought of making a crust makes me shriek and run for cover. My solution- I shredded a couple of potatoes and lined the bottom of my baking dish with them to form the ‘bottom crust’ , then I used 3/4 C. g/f biscuit mix, added an egg and enough goat’s milk to make a thin batter. After placing the filling into the dish, I drizzled the batter on top, leaving spaces here and there to allow the steam to escape. It worked perfectly! I also took precautions for spill over by putting a jelly roll pan lined with tinfoil on the oven rack directly bellow my pot pie. I am so glad you liked the filling. Thank you for sharing what you did! We sometime add diced cooked potato or broccoli to ours, depending on what we have on hand. I used the Trader Joe’s frozen gluten free pie crusts so I have a lot of left over filling whch I do not mind because crustless pot pie is delicous too! I also took one of the commenter’s advise and put in some white wine. I used frozen pearl onions too! I also added sage, oregeno, garlic and paprika. It was delicous. Thanks for the pot pie recipe and inspiring me to finally make one! I am so glad you like it! Thanks for stopping by to let me know. I always love hearing from my readers. Can I make the dough in a food processor? Can’t wait to try this recipe! Thank you for all the wonderful gluten free options. I always use my food processor to make gf pastry. Put dry ingredients into processor bowl and mix; add the butter, cut into pieces, and process intil butter is cut into small particles & incorporated into flour mix. Pour milk through the tube and process only until dough comes together in a ball. Remove to floured surface. It is unbelievably quick and you will never use another method once you have done it this way. BTW, love your recipes, blog and hints. Thank you for stopping by and sharing your process for pulling the pie crust dough together. I haven’t tried this recipe with a blend that doesn’t use rice flour. What blend do you usually use when you bake? Used 1tsp dried thyme 1 Tbs of fresh oarsley. Used premium coconut milk. Very good. Sounds yummy! Thank you for sharing. I just want to thank you for an amazing recipe! Being a baker, I was worried that the crust wouldn’t be that great as I am only just discovering all the GF blends out there on the market. The dough smelled funny raw, but I continued on. Boy did it turn out fantastic! Better than the old gluten-filled version I used to make. I know it sounds cheesy, but you’ve restored my sense of hope with moving on in my life gluten free. 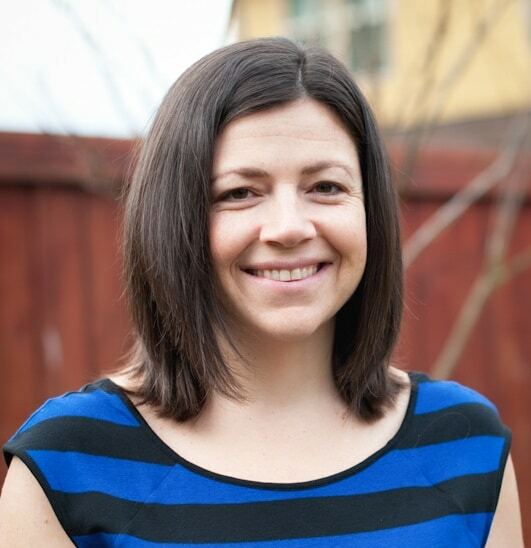 I am certainly going to spread the word about your blog with my support group as I am sure there are many other recipes here that are winners as well! Oh my gosh Serena, what a lovely comment to wake up to. I am so very glad you found me and you loved this pot pie recipe. 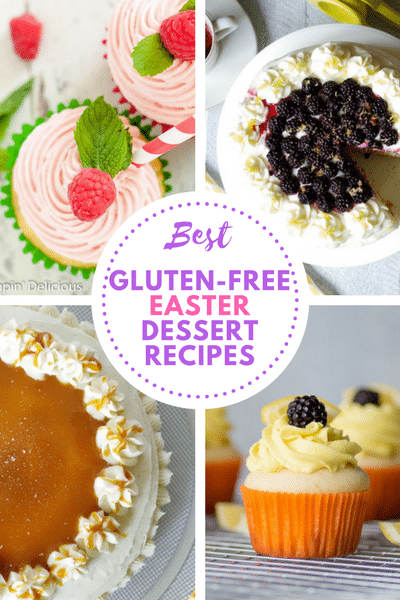 You are going to find amazing gluten-free recipes and you ARE going to be able to enjoy the foods you make. I have lots of recipes for traditional recipes (gluten-free of course) that you might like. Pizza, vanilla cupcakes, chocolate cake and cupcakes, gravy, chicken and biscuits, meatloaf, DONUTS, muffins, and pancakes to name a few – and are all well loved and highly reviewed. 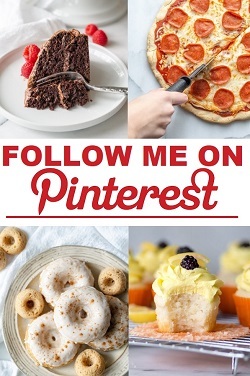 I have almost 300 recipes, so I hope you’ll be able to find others you love. Thank you for stopping by and leaving such a lovely comment. I love getting comments on the recipes when people make them. It helps me and others see that the recipe is being enjoyed. I made this for dinner tonight and it turned out delicious. I have gastritis so I had to use 2% Lactaid, used King Arthur Gluten free baking mix and had to omit the pepper but it was still a big hit for the family. Thanks for the recipe. This was actually the first dinner I’ve whole heartedly enjoyed since having to completely change my diet and it’s much appreciated! I am so glad you liked it! Thank you for stopping by to let me know.